Most substances physicists study are made up of huge numbers of particles – so large that there is essentially no difference between the behavioural properties of a drop or a swimming pool's worth of pure water. Even a single drop can contain more than a quadrillion particles. This makes understanding their collective behaviour relatively easy. For example, both the water in the drop and in the pool will freeze at 0?C and boil at 100?C. Such 'phase transitions' (i.e. from liquid to solid or from liquid to gas) can appear abrupt in these large systems, because so many particles are involved that they all appear to act at once. But what about in far smaller systems? When there are only a handful of particles, do the same rules of phase transitions apply? 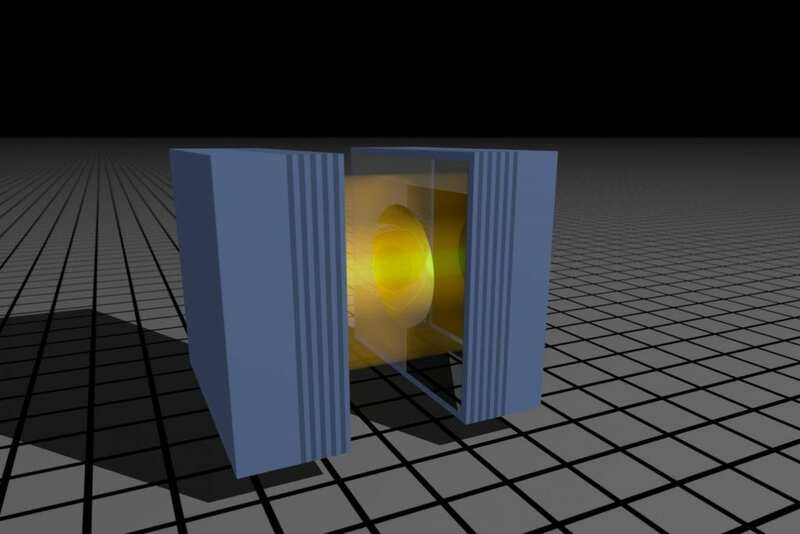 To answer these questions, a team of scientists from Imperial College London, the University of Oxford and Karlsruhe Institute of Technology, Germany, made a system of less than 10 photons, the fundamental particles of light. The results of their experiments, published today in Nature Physics, show that phase transitions still occur in systems made up of as few as seven particles on average. Studying quantum behaviour of particles is much easier with fewer particles, so the fact that phase transitions occur in these small systems means scientists are better able to study quantum properties such as coherence. Lead author Dr Robert Nyman, from the Department of Physics at Imperial, said: "Now that it's confirmed that 'phase transition' is still a useful concept in such small systems, we can explore properties in ways that would not be possible in larger systems. "In particular, we can study the quantum properties of matter and light – what happens at the smallest scale when phase transitions occur." The system the team studied was a Bose-Einstein condensate (BEC) of photons. BECs form when a gas of quantum particles are so cold or so close together that they can no longer be distinguished. A BEC is a state of matter that has very different properties from solids, liquids, gases or plasmas. The team found that by adding photons to the system, a phase transition to a BEC would occur once the system reached around seven photons, fewer than in any other BEC seen before. Being so small, the transition was less abrupt than in larger systems like pools of water, but the fact that the transition occurred at a predictable point mirrors larger systems well. The system was created with a simple apparatus – some fluorescent dye and curved mirrors. This means that as well as being useful in the study of quantum properties, the system could be used to create and manipulate special states of light. Co-author Dr Florian Mintert, from the Department of Physics at Imperial, said: "With the best of two distinct worlds – the physics of phase transitions and the accessibility of small systems – this unusual light source has potential applications in measurement or sensing."